A sacrifice zone with coal power plants, chemical industries, a port and a landfill. Fisherfolk defend the commons (the Poromboke), against pollution and encroachments affecting their livelihood. North of Chennai (Tamil Nadu, India) there is an industrial 'sacrifice zone' called Ennore. It is situated on a peninsula and is bounded by the Korttalaiyar River, Ennore creek and the Bay of Bengal. Three state-owned coal thermal power plants are under operation, next to the Ennore Port where the coal comes from. The site hosts several other polluting chemical industries, including painting, fertilizers, cement and pharmaceutical ones, as well as a landfill. In the last decades -from time to time- fisher folks, environmentalists and citizens have complained. Most recently, fishers are protesting again both the destruction of mangroves due to encroachment and pollution by industries because fishing -their source of livelihood- is being severely affected. The industries are expanding; apart from the three operating coal-fired power plants, another one has recently been cleared. Within 10km, there will be 6000MW of coal plants. All have environmental clearances, but environmentalists argue that these documents mean little. Clearance by the NTECL (Tamil Nadu Energy Company Limited) proclaims that the “Boundary for the proposed power project shall be outside the CRZ [Coastal Regulation Zone].” But the plant boundary encloses mangroves. This industrial hell of fly ash and fumes is far from the eyes of the city dwellers who benefit from the electricity and the other products. Instead, the people living here (such as fishers and workers), despite bearing all costs, don't get any of the benefits. Hereafter, we report two examples. Workers that have at once been employed to construct one of the power plant, now live with their families in miserable huts right on one of toxic fly ash dump without any facilities (water, sewage or electricity) and are abandoned to their destiny. The residents are all casual workers, many from Odisha and Jharkhand. The environmentalist Nityanand Jayaraman reports that one Odiya worker from Keonjhar said: “We came here more than 15 years ago to build the power plant. We used to live there,” he said pointing inside the plant. “Once it was built, we had to get out. Now we get by with odd jobs here and there.” Sivanpadai Veethi Kuppam, an inland fisher-folk village, has been devastated by pollution, ill-health and dwindling catches. There are hardly any fish in the creek now, villagers report. Many species have disappeared. Those with boats sail to less polluted waters to fish. Others who use hand-cast nets walk along the banks all the way to the river mouth more than 8km away, a full day's work with uncertain results. Years ago, this area was home to mangroves and fishing communities. Today, the whole site is highly contaminated. Fly ash from the thermal power plant is being dumped in the nearby riverbank and wetlands. Recently, locals started to notice the encroachment. There are signs such as “This land belongs to NTECL” (Tamil Nadu Energy Company Ltd). Nityanand Jayaraman explains that these signs are a lie, as this was never land but water and wetlands. 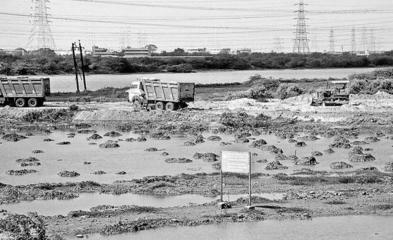 On another fly ash-covered stretch of mud flats stands a signboard declaring that the “land” belongs to the Ennore Port. This place is not land yet, but Ennore Port has fly ash dumping as a reason to be optimistic about its conversion from water to land. In revenue department parlance, these wetlands are categorised as “poromboke”– a Tamil word meaning "the commons" that has become pejorative, used to describe people or things that are totally worthless. The Ennore wetlands are far from that. Until recently, this was a healthy ecosystem with water, life and livelihoods. Such sprawling wetlands are excellent flood mitigators. Their vast surface area allows them to swell and accommodate rain waters and tidal surges. Converting them into paved real estate will exacerbate flooding and deflect the impact of storm surges to less resilient areas. From time to time, there have been complains. The Coastal Resource Centre of The Other Media, coordinated by fisherman and activist K Saravanan, has been one of the most active group. Lately, there is a new wave of protests by fisher folks for both the pollution and encroachments which are affecting their livelihood. On 31st of December 2015, The Hindu reported that “Fishermen allege that mangroves have been destroyed at Athipattu owing to works undertaken”. Fishermen in Ennore took to the streets protesting against the destruction of mangroves in the Athipattu area by a contractor engaged by Ennore Port (officially renamed Kamraj Port Limited, KPL). As severe floods had recently affected Chennai, the fishermen claimed that mangroves were crucial for limiting damage during cyclones. Also, the vegetation attracts prawns, a major source of livelihood in the area. According to A. Venkatesh, president of Mukadhwarakuppam Kadal Meenavar Cooperative Union, a sizable area of mangrove vegetation had already been leveled by dumping rubbish. The activity was being carried out on behalf of the Port, he declared to The Hindu. In late November, the Port faced similar allegations when activists claimed about 400 acres of hydrologically-sensitive wetland area was being dumped with the spoils of dredging as part of the Port’s development activities. In its response to the activists, the KPL, in a letter, said it had purchased land to the extent of about 683 acres adjoining the Ennore creek from the salt department. 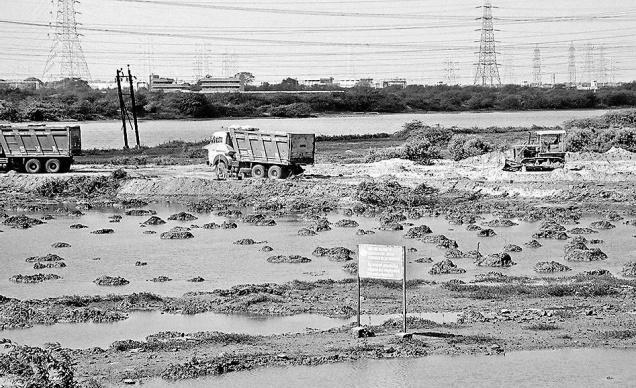 The letter stated that: “...the dredged material has been dumped at low-level area at the south of North Chennai Thermal Power Station road where [exists] the land purchased from the salt department. It is informed that filling is proposed in KPL land only and not in the waterbodies”. It also assured the natural flow of the creek would not be disturbed. However, Mr. Venkatesh disputed the claim and said the very fact that mangroves have been leveled shows that a very sensitive area has been filled. He said to The Hindu that: “This activity is also a violation of CRZ notifications. Our community will scale the protests up if this does not stop immediately”. The conflict is on-going. Project Details Ennore Port, officially renamed Kamarajar Port Limited, is located on the Coromandel Coast about 24 km north of Chennai Port, Chennai, it is the 12th major port of India, and the first port in India which is a public company. The Kamarajar Port Limited is the only corporatised major port and is registered as a company. The Centre holds a stake of about 68 per cent in the Kamarajar Port Limited and the remaining 32 per cent is held by the Chennai Port Trust. The port has been able to attract an investment of Rupees 26,000 million by private entrepreneurs on various terminals. Kamarajar Port Limited, designed as Asia's energy port, is the first corporatised port in India and has only 86 employees. Envisaged being a satellite port to decongest and improve the environmental quality at the bustling Chennai Port, Kamarajar Port Limited is evolving itself into a full-fledged port with the capacity to handle a wide range of products. With a permissible draught of 13.5 m, the port handled a total volume of 11 million tonnes in 2010–11, up by 2.86 per cent from the previous year. Coal for the power stations comes through the ports and is transported by truck or conveyor belts. Why? Explain briefly. Fisherfolk have not been able to stop the projects, more coal power plants will be built. There is an appeal to the Green Tribunal. Bay of Bengal (India): Part I"
(1) University of Madras, Dept. of Economics, Chellammal Women’s College, Guindy, Chennai-600 005, India. “Ennore fishermen protest ‘destruction of mangroves’” by Sruthisagar Yamunan published at The Hindu on 31st December 2015. "Remember this much. The sea will eat you" by Nityanand Jayaraman published at Grist Media on November 26, 2014.